On Friday 8th March , 2019 WHYFARM successfully launched its project “Creatively Empowering Youth and Kid Agripreneurs as Global Citizens to Achieve Food and Nutrition Security by the Year 2050” at the United States Embassy of Port of Spain, Trinidad and Tobago. This project, to be executed until April 2020 was 1 of 15 winners of the 2018 Misk Grand Challenges funded by the Bill and Melinda Gates Foundation. The project launch saw the room filled with Private Sector stakeholders; Financial Institutions, Research Institutions, Civil society, Government, Media houses and Policy Makers. The highlights of the launch included endorsements from the U.S Embassy Trinidad & Tobago, Machel Montano Foundation for Greatness, the Inter-American Institute for Cooperation on Agriculture (IICA )and the University of the West Indies St Augustine, Faculty of Food & Agriculture. Speaking at the launch event Mr. Alpha Sennon, Founder of WHYFARM gave the audience insight into the four project components: 1)agri-entrepreneurship training and mentorship program, 2) school farm to table competition, 3) AGRIman Agventures comic books, and 4) a fun museum and food factory park. These four elements will build human capacity and agency, influence perceptions, behavior and policy to support youth engagement and participation in Agriculture in T&T. Mr. Sennon echoed words of “Collaboration not Competition, Complementing not Reinventing” as WHYFARM seeks to execute the projects in the coming months. A special appearance was made by the world’s first Food and Nutrition Security superhero “AGRIman”. AGRIman officially released his new comic book “AGRIman AGventures Issue #1: The beginning: Grampa’s magic seeds. 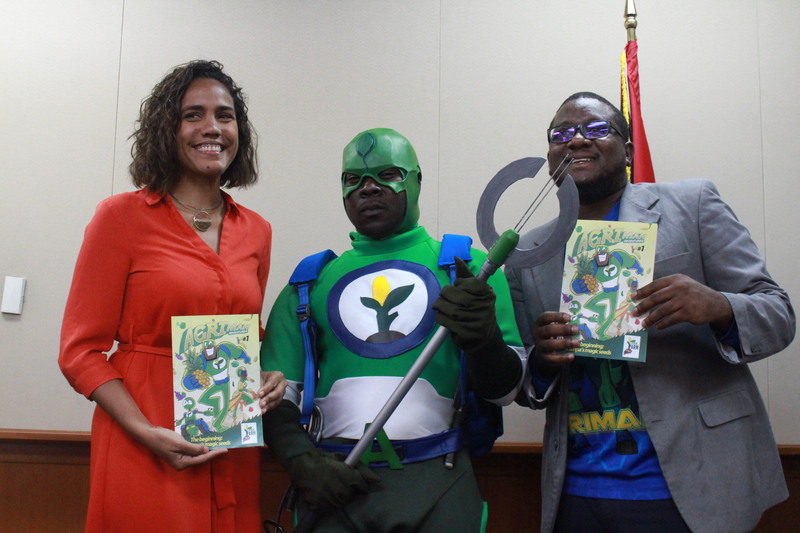 During the comic book launched AGRIman highlighted his journey from World Food day 2015 in Tobago to having been recognized globally as an AGbassador for creatively engaging youth through Agri-Edu-tainment. In recognition of International Women’s day 2019 AGRIman introduced a SHEro to our AGRIverse “PhotosyntheSista” who was conceptualized by children. To increase the impact of the project and leverage co-benefits and synergies WHYFARM will partner with many government, public, private and international organizations in T&T and abroad who all contribute to youth empowerment and agri- entrepreneurship.